Comparing Polar Patterns For Vocal Close-miking: The following audio examples were all carried out with a Groove Tubes GT57 large-diaphragm condenser microphone, an affordable mass-produced model with a choice of three polar patterns. Here's what the cardioid polar pattern sounded like at a distance of around 20cm from the singer's mouth (Ex05.01:WAV/MP3 ). Now compare that with the sound of the microphone when operating at the same miking position, but using its figure-eight (Ex05.02:WAV/MP3 ) and omnidirectional (Ex05.03:WAV/MP3 ) polar patterns instead. Clearly, the latter file captures a little more room sound than the cardioid or figure-eight recordings, but that can easily be remedied by reducing the miking distance (Ex05.04:WAV/MP3 ), given that omnidirectional designs suffer negligible proximity effect. Techniques For Reducing Loudspeaker Foldback Spill: There are various ways you can reduce cue mix spill into the vocal mic when using loudspeakers for live-room foldback monitoring. The simplest tactic is to put the foldback speaker(s) in the rejection null(s) of a directional microphone. This audio file (Ex05.05:WAV/MP3 ) shows roughly how effective that is when using a budget large-diaphragm mic in cardioid mode, with a mono foldback mix coming from a single speaker placed 80cm behind the mic in a fairly dry acoustic -- I also recorded the same configuration with the mic in omni mode (Ex05.06:WAV/MP3 ) for comparison purposes, so you can get a good idea of the degree of foldback rejection. Here's a similar test using the same mic's figure-eight polar pattern (Ex05.07:WAV/MP3 ), but this time with a stereo foldback mix coming from speakers either side of the mic at a distance of 50cm, directly on the polar pattern's plane of rejection -- again, here's the sound of the same mic in omni mode under those circumstances for comparison (Ex05.08:WAV/MP3 ). Another alternative is to use a mono monitor mix from a pair of speakers equidistant from the microphone, but with the signal polarity of one speaker reversed to cause phase-cancellation of the spill at the mic diaphragm. Here's a demonstration of this technique with our mic in cardioid mode and the two speakers set up around 80cm behind the mic, and about 60cm apart (Ex05.09:WAV/MP3 ). For comparison, here's a recording of the same setup with the single-sided polarity inversion bypassed (Ex05.10:WAV/MP3 ). My favourite spill-reduction method, however, is recording a separate spill-only 'cancellation pass', which can be polarity-inverted and mixed with the spill-laden vocal recording to achieve remarkable results, even when you're using two-speaker stereo foldback in conjunction with an omnidirectional polar pattern, as in the following examples: here's the omni mic's vocal recording with its foldback spill (Ex05.11:WAV/MP3 ); here's the spill-only cancellation pass captured with the same mic(Ex05.12:WAV/MP3 ); and here's the spill-cancelled mix of those two recording passes (Ex05.13:WAV/MP3 ). 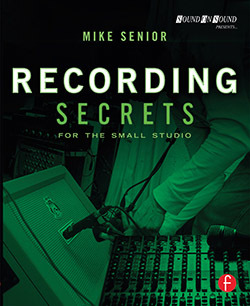 Vocal Microphone Shootouts: See the Chapter 4 resources page. Inline Preamp Adaptors For Passive Ribbon Mics: Many budget preamps struggle to provide enough gain for passive ribbon mics, but you can now get phantom-powered in-line preamps specifically for this situation which provide some additional clean gain (typically around 20dB) so your main mic preamp doesn't have to work as hard. The pioneer in this respect is the Cloud Microphones Cloudlifter series of products, although Triton Audio now also offer something very similar in the form of their Fethead range. SE Electronics Reflexion Filters: As mentioned in the book, the SE Electronics Reflexion Filter range are well-designed acoustic baffles which can be useful for reducing foldback spill when a vocalist wants to use loudspeaker monitoring. More Information On Microphone Designs: See the Chapter 4 resources page. More Audio Examples Of Loudspeaker Foldback For Vocals: This Sound On Sound magazine article touches on many of the loudspeaker-foldback techniques mentioned in the book, and includes further audio examples if you need any more convincing!